Last week I shared my recipe for Tahini Goddess Dressing. Today I’m showing you one of the most delicious (and nutritious!) ways to enjoy it, on this Vegan Goddess Bowl! This bowl is for everyone, not just those who consider themselves a “goddess”. We’re going with that name because the Tahini Goddess Dressing is integral to this bowl. (Plus, Vegan Brown Rice, Chickpea, Smoked Tofu, Avocado, Cucumber, Carrot, Dried Cranberries, Toasted Pecans and Tahini Goddess Dressing is a little long-winded for a recipe title, don’t you think?) Another alternative name was the No. 2 Bowl (because this IS a copycat recipe to The Chopped Leaf’s No. 2 Bowl) but without the accompanying No. 1 and No. 3 bowl on Chopped’s menu, I didn’t like the connotations that inevitably surround the title of “No. 2 Bowl”. That’s more than enough of my thoughts on recipe naming. Let’s talk about the Vegan Goddess Bowl! I’ve covered all the key ingredients in the second paragraph’s ramblings. So let’s focus on what this bowl has to offer! 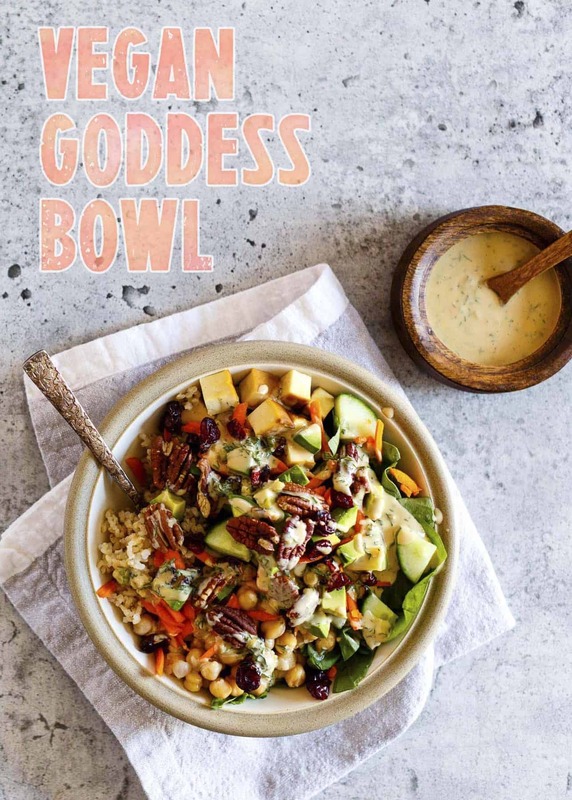 If you like meal prepping, or need to pack a filling lunch for work or school, the Vegan Goddess Bowl is ideal! You can easily prep the ingredients ahead of time and assemble when you’re ready to eat. I’ve got tips in the recipe notes section for assembling this bowl for packed lunches or meal prep. This bowl is very satiating. The healthy fats, complex carbs and protein are an excellent combination for a filling a lunch or dinner. Using cooked brown rice and canned chickpeas, this recipe takes less than 20 minutes to prepare. That includes the time to whip up the Tahini Goddess Dressing. This bowl is full of flavour and texture. The Tahini Goddess dressing is creamy, tangy and full of punchy flavour from lemon juice, garlic, fresh herbs, and a touch of sesame oil and soy sauce. The toasted pecans and cranberries add a nice mix of nutty and sweet pops of flavour. Like any power bowl, this recipe is highly customizable. As I mentioned earlier, this bowl is a copycat recipe for one from The Chopped Leaf. In this recipe I used smoked tofu but The Chopped Leaf uses marinated tofu. Sunrise Soya makes an awesome marinated tofu that I would prefer to use but it’s not available in my area. If you can get your hands on some, use that instead! You can substitute pan-fried tofu or our Sriracha & Soy Sauce Tofu instead. Add some prep time if you’re cooking tofu instead of using the store-bought options mentioned above. If you’re not a fan of tahini-based dressing our Vegan Ranch Dressing would be delicious on this bowl. Walnuts, pistachios, pumpkin seeds, or hemp hearts would be great in place of the pecans. Omit the dried cranberries if they’re not your thing. Increase the protein even more with quinoa instead of brown rice. Whole wheat couscous is a great option if you’re looking for something that cooks faster than brown rice. Warm brown rice and tofu. Begin with a bed of brown rice. Add spinach, warm smoked tofu, chickpeas, cucumber, carrot, avocado, pecans, and dried cranberries. To prepare in advance: Combine all ingredients except brown rice, tofu, avocado and dressing. Just before serving, warm brown rice and tofu before adding them to the bowl and top with avocado and Goddess dressing.